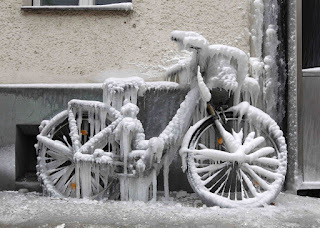 As it was a little bit warmer this morning, I wrapped myself up in a few less layers for my bike ride to work. Although I'm generally a bit nesh and feel the cold, I've actually not been too bad this year... I've been mostly running in shorts and have only worn leggings for my bike ride over the last week when it turned really cold. Maybe I've lost more sensation than I thought. Still, today felt a bit warmer, so I left a couple of layers at home and set off at about 06:45 as usual. It's been absolutely gorgeous at this time of the morning recently, and today was no exception: crystal clear skies with a sliver of moon and all the stars on display, with dawn just barely brightening the furthest edges of the eastern horizon. It might have been a little less cold, but there was also still clearly a pretty hard frost on the ground. 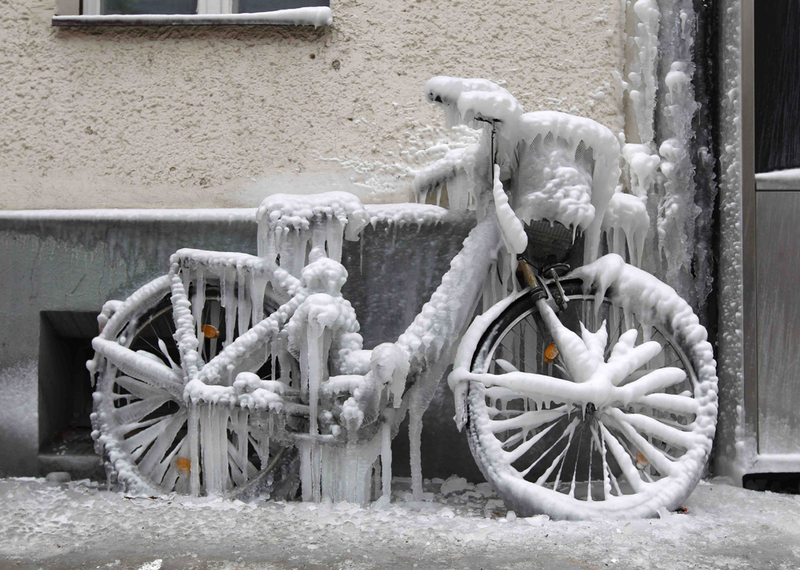 You're pretty vulnerable on a bike at the best of times, but ice is a particular menace: once your wheels start to slide, you're on the ground before you've had a chance to react. I'm never a particular speedy cyclist, and it sometimes feels like I'm being overtaken by old ladies with baskets on the front of their bicycles.... but on days like this, I cycle even more slowly than usual. My commute is a little under 4 miles, and it's mostly along cycle paths and away from traffic. Usually, that's a good thing. Today? Well, on icy mornings, there's a lot to be said for a gritted road. Less than a mile into my ride, I cross the river Trent on a pedestrian suspension bridge at the Embankment. It's has ridged wooden slats on the main span that always seem to catch the frost. I'm always super careful along here, today that meant riding along at about 1mph. I still overtook a lady doing about 0.5mph, but both of us were being very cautious in the pre-dawn light. As I eased down the ramp on the other side, I contemplated my turn left onto the road. I always take this slowly anyway, because I'm afraid of coming off and shooting out into traffic. There was no traffic at this time of the day, but I applied my brakes and slowed down even more. I made it around the corner, but as soon as I applied power to my pedals, my wheels slipped out from under me and I was down. Apparently, no matter how careful I thought I was being, I clearly wasn't being careful enough. As I lay on the side of the road deciding how I felt about this with my wheel spinning comically in the air on my bike beside me, my mental inventory of my limbs was interrupted by the lady I'd overtaken asking me if I was okay. Um, yes. I think so. I'd hate to have been travelling any faster, but I seemed to be bruised and grazed, but otherwise alright. I thanked her again when I cycled past her a couple of minutes later. Apparently, the council put a man on that slope later on in the morning to warn people about the black ice down there because lots of people had been coming off their bikes (well, they could also try gritting it....that would be cheaper than manning it for a couple of hours, wouldn't it?). All things considered, I guess I was lucky to escape with a slow-motion tumble and a couple of grazes. As this happens at least once a year, I keep a roll of plaster in my desk drawer at work for exactly this reason (and it never fails to amaze me that I can have big grazes on my knees and elbows even though the layers on top don't seem damaged at all. Friction burns, I guess. Still, given that I've cycled over 1,000 miles to and from work this year, and I think this is my first fall...maybe this was coming. Some people look out of the window at a frost and decide to get the bus to work. I do not (because I'm stubborn and stupid, as we all know). Well, it's a few more interesting scars to add to the pile, if nothing else. I might walk the bike down that slope tomorrow though, eh?